Preorder your custom Lily Pad socks in time for the 2018 Run UP for Downs!!! These socks will be custom printed by our friends at John’s Crazy Socks. 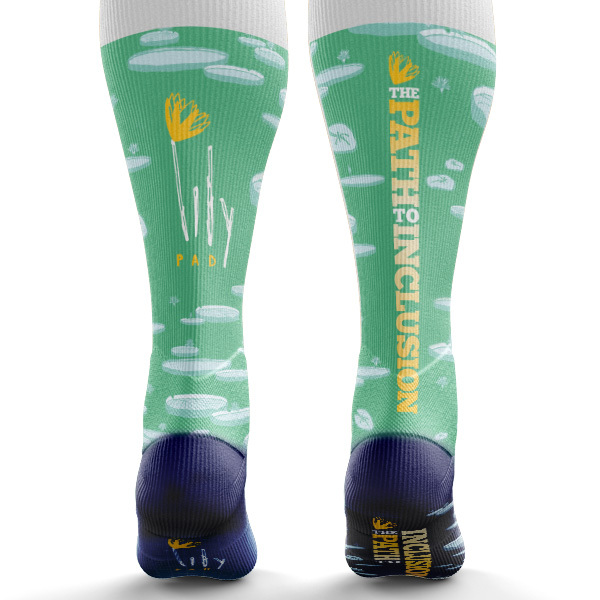 They feature The Lily Pad logo on the left side and our tagline “The Path to Inclusion” on the righthandside and this is repeated on the foot of the sock. Men with shoe sizes 6 – 13. We are doing a 2 week preorder process and then will be putting our order in to John’s Crazy Socks. It will take them 4 weeks to print the socks and our goal is to have the socks ready for you to pick up at the 2018 Run UP for Downs.